Featuring a Graded Hammer 3X (GH3x) keyboard with synthetic ivory keytops & a beautiful polished ebony finish, this Clavinova Digital Piano has everything you could want in your first piano, including two of the world's finest grand pianos: the Yamaha CFX and Bösendorfer Imperial. "Real Grand Expression": Sound, touch, pedals–perfectly integrated to give you the sensation of playing a grand piano. Real Grand Expression. This phrase defines the expressive capability of Clavinova. It is not only the full realization of the sound, the touch and the pedals, but the application of technologies nurtured by crafting acoustic pianos to perfectly integrate these three elements into a single piano. This piano produces the exact sound you want through the touch of the keys and the feel of the pedals. As you play, you will truly feel as though you are playing a grand piano. Pianists can change the volume of the sound—as well as its dynamics—to achieve both mellow and bright tones by simply changing the pressure they apply to the keys. The CLP-625 features long, carefully-sampled recordings of notes on a piano, reproduces them in rich detail and utilizes unique Yamaha technologies to achieve smooth tonal transitions in response to the touch of the player. Featuring Yamaha Smooth Release technology, CLP-625 offers the crisp tone heard when playing staccato as well as the lingering sound produced by releasing the keys slowly. This provides a finely-nuanced response to the pianist's playing. 256-note polyphony: Play many notes simultaneously without any unwanted dropped notes. The keys on the CLP-625 are constructed so that the support point hidden inside the instrument body is as far from the key tip as possible, improving playability and comfort, even deep on the back of the key. This construction provides good key travel, even when performing pieces played mainly on the black keys and the backs of the white keys, allowing nuanced variations in touch and broadening your expressive range. Similar to an acoustic piano, the Clavinova is calibrated carefully, with speaker positioning and body materials checked to ensure that the entire instrument resonates optimally. For a sound image that is very close to the grand piano, these instruments feature Tone Escapement in several locations throughout the body that allow the sound from the speakers to be projected to the listener’s ears without being trapped inside the instrument. The recording function featured in the CLP-625 allows you to record your performances* with a single touch, which is useful when you want to review your playing objectively. Additionally, you can record up to 2 tracks for simultaneous playback, so different hands can be recorded separately or overdub parts with different Voices. 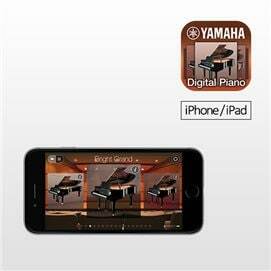 If you use an iPad, iPhone or iPod touch, Yamaha apps will make playing more convenient and enjoyable!